I’ve been derelict in my posts, but I’ll catch up a bit here. 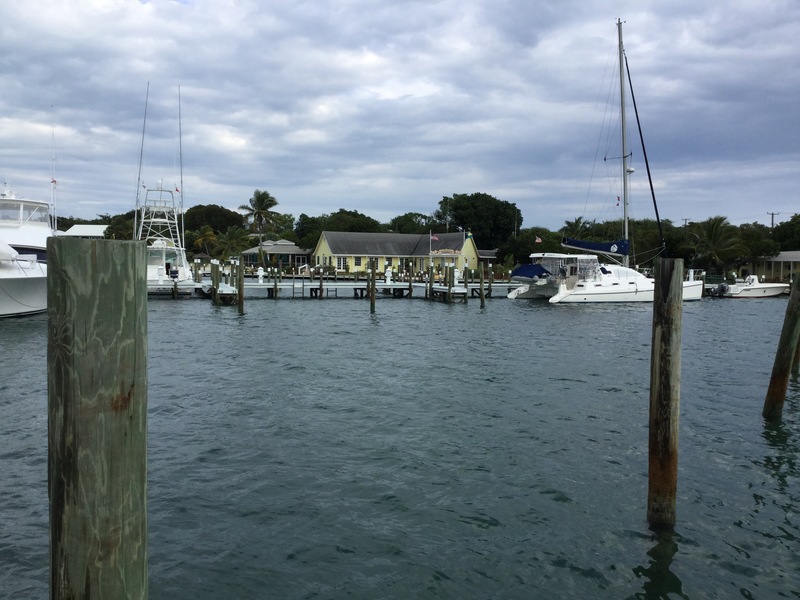 On the 12th Joe (Onward) reserved 2 moorings in Hopetown, so with a good forecast on getting thru the Whale passage we checked out of the Green Turtle Club Marina and headed for Hopetown. The Whale was passable, but the seas were running up to 7 feet at times with nearly breaking waves. Turned out to be an easy passage, but somewhat intimidating waves. After getting thru the cut we checked tides at Hopetown using our explorer charts and determined that we would be on about 1/2 tide rising, which is good since there are a number of shallow spots. Turns out we were on a falling tide about an hour before low. That said we had no issues getting in and only discovered the tide state the next day on the weather forecast. As today the 21st we have had two fronts come thru with up to 40 knot winds. Only problem was a close catamaran who had extra line on their mooring buoy and we actually touched their grill with our bow once. After he shortened his lines and we lengthened our the problem was solved. Peggy (Onward) had some disk isuues and needed an MRI for diagnosis, so she flew home to Long Island, NY. The news is all good, surgery is not necessary, and she is feeling better and will return Saturday if the weather cooperates. We awoke to our alarm at 6:30 to check the bilge and listen to the weather forecast. We listened to the forecast and then called Chris Parker, the weather forecaster we use, on the SSB radio with our plans. He confirmed that crossing the Gulf Stream was good, but the overnight weather on the Bahama banks was unsettled and there was a chance we would see convective squalls with winds up to 30 knots, but otherwise 10-12knots out of the SW. We talked with Joe and Peggy on Onward and decided the forecast was good enough, so we raised the anchor and headed out around 8:00. The inlet was great except for the power boat wakes and we were soon in the Atlantic. 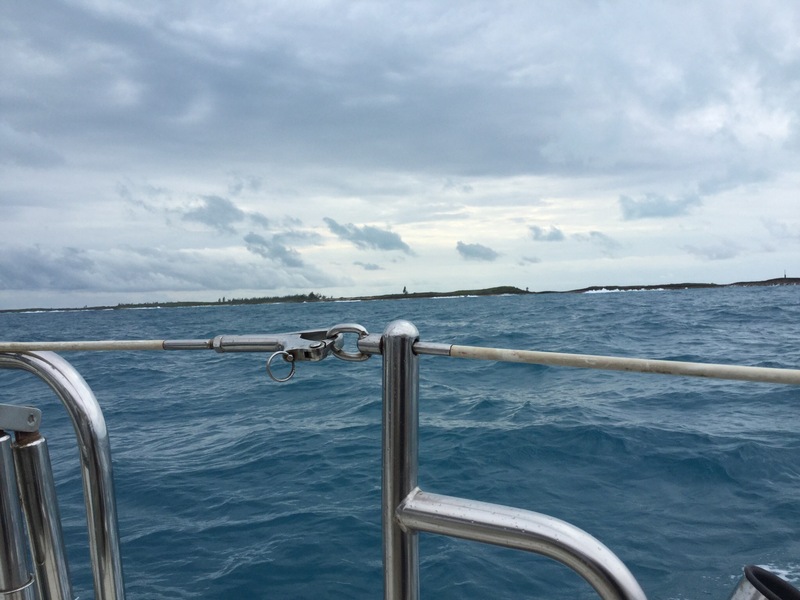 Winds were to light to sail, so we motor sailed in SW winds around 10 knots, with a gentle 4-8 foot swell. Conditions improved to farther we got and we crossed on to the banks at Memory Rock around 4:00. Conditions on the banks were perfect, but still not enough wind to sail without the engine. We set our watch schedule for the night with Ed on watch till midnight and Tina on until 3. We both overslept but the conditions were so mild it was not a problem. There were stars overhead most of the night, but we could see the flashes of lightning way off in the distance, but never heard thunder. The plan was to enter Green Turtle, White Sound, after sunrise. As we got closer it became obvious we were ahead of schedule, so we could finally kill the engine and sail. It was great. As the skies started to brighten the squalls finally caught up with us so the winds clocked and built to 28 and it rained, but no lightning. By the time the rain stopped and the winds died a bit the were ready for us at the Green Turtle Club Marina and we headed in. By 9:00 we were secure in our slips and the sun was out. One of the nice things about Green Turtle is that they arrange for the Customs agent to come to the boat and check you in. Since it was Sunday we expected them to tell us that we would have to wait until Monday, but the new Customs agent works on Sunday. We were checked in by noon and we lowered the quarantine flag and raised the Bahamas courtesy flag. We were here, and in record time (for us)! 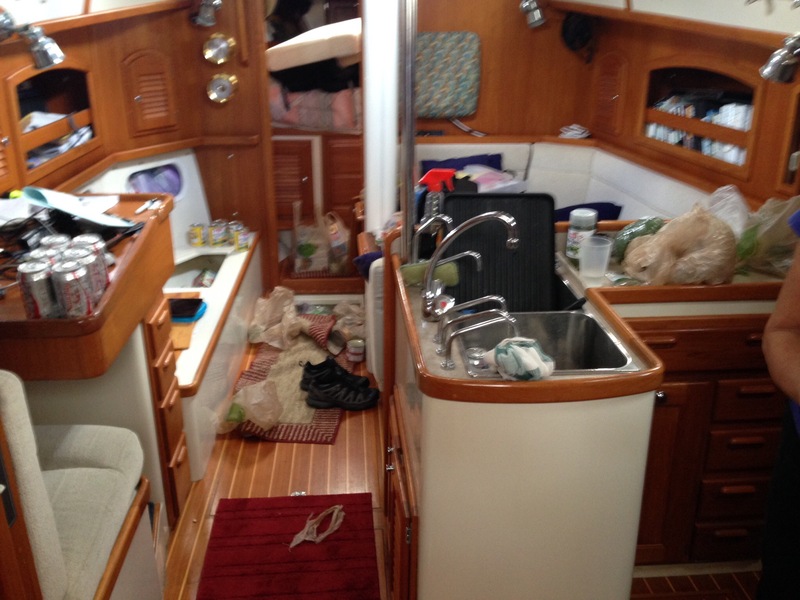 After a wonderful Thanksgiving, Christmas and New Years at home with family and friends we got back to the boat Wednesday Jan 6th and spent 2 frantic days provisioning for our stay in the Bahamas. 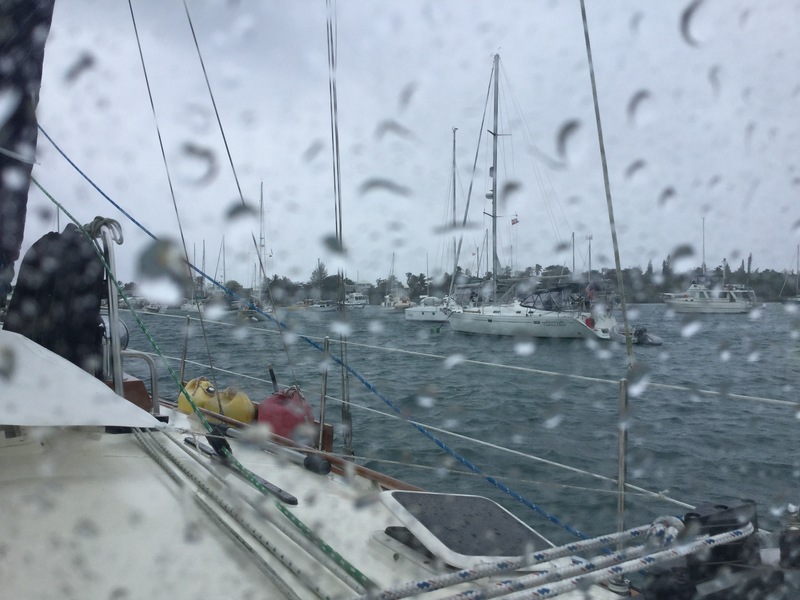 The weather has been windy and rainy here so we weren’t sure when we could leave and get across the Gulf Stream, but it looked like Friday night might work, so we left Stuart along with Onward and headed south down the ICW to the next good inlet….West Palm Beach. It was dark when we got there and the Gulf Stream forecast for Friday night was for north winds and up to 14ft seas, so we anchored by the inlet to wait. Ed had been hearing some clicking during the day, but couldn’t locate the source. After turning off the engine it continued and we located the source. It was our bilge pump. We have a counter on the pump and it had run 75 times during the day. We have a drip less seal on our prop shaft and the bilge stays dry, normally. Checking the bilge there was a steady stream of water from the stern which tuned out to be the now not so drip less seal. There is a collar around the prop shaft that seals against a carbon ring at the end of some bellows. The collar had moved on the prop shaft and was no longer sealing against the carbon ring. Ed loosened the set screws, slid the collar back into place compressing the bellows and retightened the sets crews and the locking set screws above them. The seal was installed in sub freezing conditions several years ago and apparently the screws were not tight enough. (A week later and all is still drip less). We had some dinner and went to bed with the intent of checking the weather forecast in the morning. 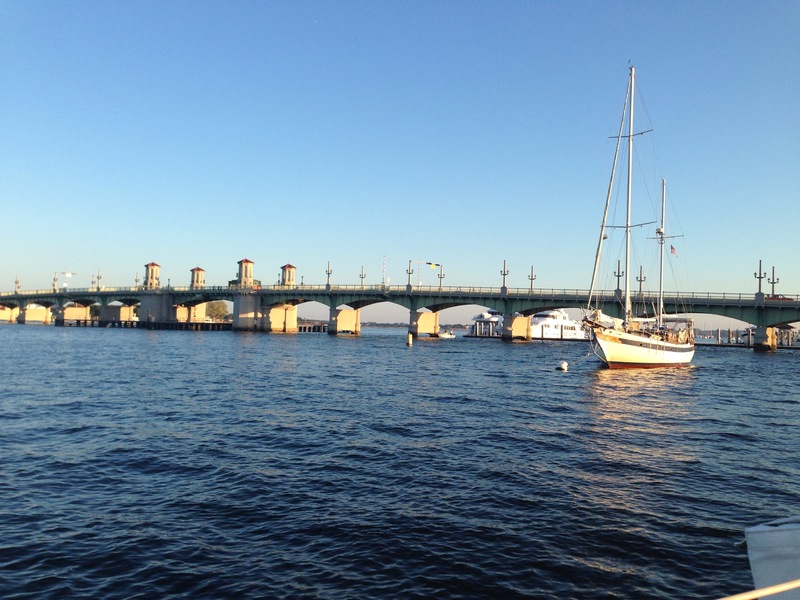 We arrived at Stuart after a 40mi trip including a bit up the St Lucie River on Thursday. Where the river crosses the ICW sand banks move regularly and the markers are moved to reflect the deepest channel. That said we only had inches of clearance at a few spots, but we made it. There have been spotty showers and thunderstorms the entire time we have been here and last night we got soaked walking back to the boat. Today we head to Fort Lauderdale to head home for the holidays. Update: drove to FLL this morning and turned in the rental car at the airport. After waiting in long lines to check bags and then again for security we are now sitting and waiting to board. These big airports sure make traveling on a sailboat seem much more relaxing. 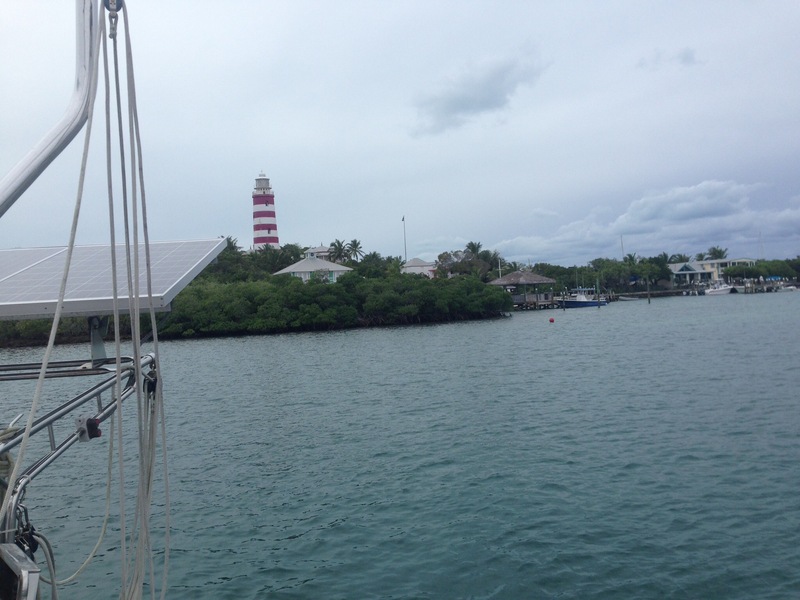 We arrived at Vero around 2 in the afternoon on Saturday after motorsailing down from Cocoa. After drifting around the mooring fiend for 20 minutes waiting for the fuel dock to clear we filled up on diesel. We only used 36 gallons to get here from Beaufort, SC. All of the deep draft moorings were full so we rafted up alongside Willoway, a good friend from Annapolis. Sunday we enjoyed a great dinner with Skip and Harriet at Amalfi. Skip and Harriet moved here several years ago and like so many other cruisers we know who have sold their boats and moved here, they love it. We will stay here until Thursday relaxing and doing boat projects. 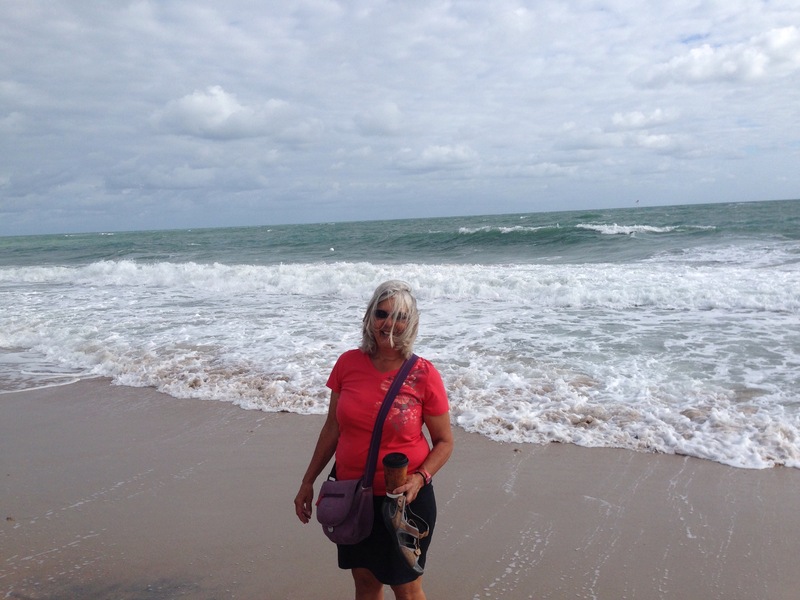 On the beach in Vero. We left St Augustine yesterday morning as soon as the fog lifted, which was around 8:30. 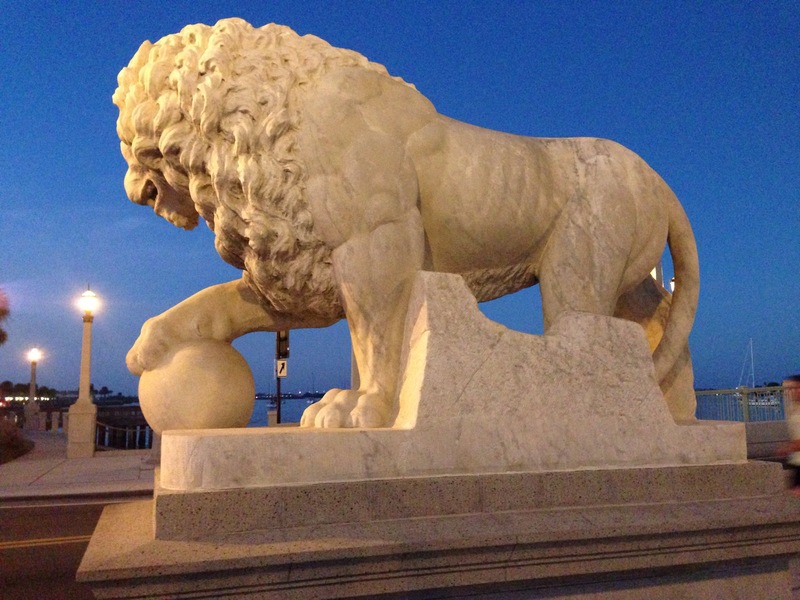 We got the Bridge of Lions opening and continued south with a fair current. By 3:30 we were anchored by the Memorial Bridge in Daytona listening to the high rev engines over at the speedway. The 24 hour classic is Saturday and night practice was Thursday. We awoke to more fog, but light enough to depart at sunrise. Our goal was to get to to the NASA Causeway bridge at Canavaral before the closed it for the evening rush. We made it with over an hour to spare. We anchored at Cocoa and went in to town for dinner. The sleepy, funky village is now built up a bit more which I guess is good for the economy but a bit disappointing. Had dinner at the bar overlooking the anchorage. Beer and sandwiches, all we needed. Lows tonight are forecast in the 70’s, but the weather is taking a turn for the worse next week. It’s been so good that it’s hard to complain. Tomorrow Vero! We left the dock in Besufort around nine, raised the sail and motor sailed out the Port Royal Sound passing Paris Island. After we got to the ocean the winds filled and we killed the engine. The winds built to about 20G24 so we put in a reef and carried on at 7+ knots. We sailed all night enjoying the lack of engine noise. Just after sunrise the winds died and the engine was back on. We had never been into the inlet but with 3′ swells from the NE it was a piece of cake. All of the markers were in the right place, tide was near slack high and the fog was lifting. We called the Municipal Marina and they assigned us a mooring by the old Spanish fort. Being Veterans Day we were treated to a parade while sitting in the cockpit. Went ashore to visit and have lunch then back aboard for Tina to nap. A very nice ocean run bypassing all of the Georgia shallow spots. After spending a few days in Charleston enjoying the sights and food we moved on down towards Beufort,SC. The waterway is beautiful down here and very desolate, only marshes for miles. We are anchored for the night waiting for a front to come in with wind and rains. Glad we have a good heavy anchor and lots of chain. The front arrived about 4AM and blew 28 gusting to 36knots, about 40 mph gusts. Boat seemed to stay put, but it woke us up for a few hours. Winds are back below 20 so we will pull up the anchor and head off soon for a slip in Beaufort where we can refuel, do laundry and celebrate Tina’s birthday. After 2 more travel days, one in the ditch and one in the ocean, we arrived in Charleston Harbor. We made a quick pass by Ft Sumpter and then found our slip at the Mega Dock. We are having drinks and then out to dinner with friends. More later.